Now that would be an interesting double feature for those of us whose life is just a bit too happy for comfort: first, see how a little family trying to cope with a seriously depressed sister / in-law now also has to deal with the impending and inevitable end of the world. Everybody knows it’s happening, and only the one person who is not even able to get out of bed alone finds the right attitude to cope with it (that would be this movie). 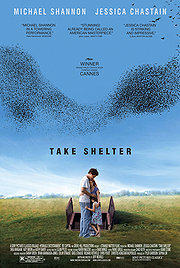 And then watch Take Shelter, where Curtis LaForche, played by the ever-amazing Michael Shannon, is confronted with the impending storm sweeping away maybe just the neighbourhood, maybe the whole world. Here, only he apparently can see the signs, and his life history gives him very little experience how to deal with forthcoming apocalypses. So he does what he does best and by profession: he digs a hole in the ground and builds a shelter. No, what he actually does is “believe”: he has no reason to believe that the storm is coming, his family runs a history of schizophrenia, all the factual evidence points to him just another case of crazy. But belive he does, and act upon it, even though this estranges him from his dog, his colleagues and his family. Maybe he is just insane, maybe he has legitimate visions and precognitions, he has no way of telling which, but he still has to decide what to do. Shannon plays this with the pain-ridden expression that I so much love since Revolutionary Road and Bug, but in particular since his he grabbed the attention away even from Steve Buscemi though his torn and tormented Nelson Van Alden in “Boardwalk Empire”. It seems Shannon invented a new genre of type-casting just for himself: the man who should know what is right, but doing the right thing hurts. The rest of the cast does what is necessary to showcase this, the omnipresent Jessica Chastain and the other Boardwalk remnant Shea Wigham have mostly very subdued parts to play. Each has one plot-changing moment of outburst – and each time they show how capable they are. Nice review, I hope to be able to grab this at a red box and check it out this weekend. I wanted to catch it at the theater but sadly it did not play anywhere around here. Shannon is super intense in Boardwalk Empire and by your description this looks to be more of the same sort of mesmerizing performance. indeed, intense is what it is… I just looked into Shannon’s forthcoming projects, and I am getting a bit worried about him doing these summer blockbuster things… let’s hope he keeps up these small projects where he can just burn up the screen. Hey Thomas, I finally got a chance to see this and it was amazing. So much to think about with this film. A masterful perfomance by Shannon to be sure.